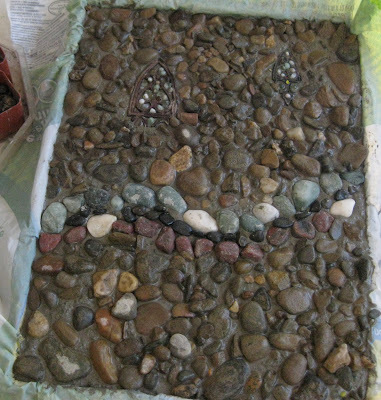 Although the walls of the Fairy House (Part 1 of the Fairy House story here) were allowed to stand until they were well cured and sturdy, I worried that trying to top them with a concrete roof would be difficult and too heavy for me to manage. As it was, each wall was difficult to carry and get into position; I couldn't imagine moving something weighing twice as much. Therefore the decision was made to make the roof from hypertufa. My friend Frances from Fairegarden is an expert at hypertufa so I knew I could rely on her assistance, long distance, in the event of any complications. I gathered the necessary ingredients and mixed up my first batch of hypertufa! I had chosen a box that, tipped on its edge, would make the right size roof. It was at this point that the idea of the Fairy Castle changed into the Fairy House. Inspiration/desperation provided this roof idea and not one more castle-like. 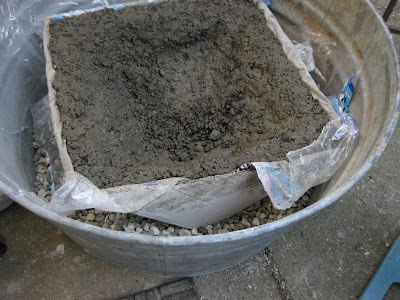 The box was cut, tipped up, nestled into pea gravel in a large galvanized tub, lined with plastic, and filled with hypertufa mix. It was allowed to set for about a week. Although it was warm outside, the roof was large and quite solid. I did not want to risk unmolding it too soon. However, on the day I was going to find out if my experiment worked, I called in back-up help. The problem turned out not to be with the sturdiness of the structure. The problem was that someone chose to use the plastic from a package of Costco toilet paper as the liner. Just one more step in my education! I did indeed try sanding the "stain" off but realized fairly quickly that it was going to take way longer to do than I could stand. Inspiration/desperation once again came to my rescue. The roof was set on the walls and mortared in place. Green dyed mortar was mixed and applied over the entire top of the roof and brown dyed mortar was used for the gable area of the end walls. The advantage to using the mortar here is that I was able to texture it in a decorative way that I liked. The roof was given a bit of a thatched look and the gables were textured to look somewhat shingled. The house was coming together, step by step. The next thing needed was a front door. And I already had a plan for that. It was a great Christmas for me...good family Rock Band and Trivial Pursuit fun, decent food, great cocktails (thanks Melissa!). Now that the horrible rip-off-the-bandaid moment of departures has passed I find I may survive. Today the washing machine is going nonstop as guest beds are changed and table cloths and napkins are washed. Time to check back in with the garden and see what needs to be done. Sophie and I decided that the Fairy House needs a well, so that is on the list for today. Hypertufa mix is ready for water to be added. The correct form is being pondered. The rocks that Sophie painted (with help from Leanne) have been placed in the Fairy House yard, just in case any fairies are unsure of their welcome! 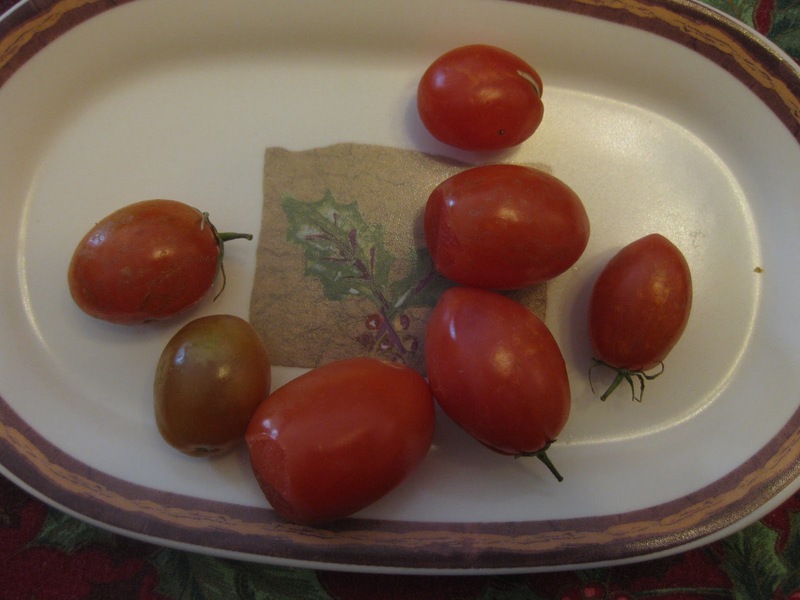 The freezes of last week convinced me that it was more than time to pull out the last cherry tomato plant. The few remaining tomatoes might not be wonderful by midsummer standards but at least they are local! After all the Christmas treats a salad for lunch sounds like just the thing. And just in case all that red in the other photos was getting to be too much, here is Rosa Flawless from the Cutflower Collection of Roses getting ready for the New Year. I picked this up about 2 years ago at an event at UC Davis. It was in a 4 inch pot and has been a good rose for me...very disease resistant, a compact plant, and it keeps blooming. Just the thing to lift the spirit suffering from post-Christmas blahs. The roses are blooming nicely despite night time temperatures that keep hovering at or just below the 32 degree mark. Not lots and lots of bloom but pink Flawless, above, Flower Girl, below, and miniature rose Demitasse all have several blooms each. Osmanthus heterophyllus, holly leaf osmanthus, has just begun blooming. Planted as a possibly useful plant for holiday decorating, the disappointing reality is that many of the leaves are not holly-like at all. Still, it is a nice border shrub and smells delightful when in bloom. Plumbago auriculata has grown up into the arbor that supports two Banksia roses. The evergreen roses protect the more fragile plumbago and for now it is still blooming. It should eventually go dormant for a couple of months although the cold nights we've had this month haven't made that happen yet. Anisodontea is in full bloom, the cold nights are of no apparent concern. Abutilon Souvenir de Bonne has several blooms and buds. Workhorse Argyranthemum frutescens blooms much of the year and is useful for little bouquets. It is actually happier now than it was a couple of months ago in the heat. Allysum blooms here and there, adding a bit of color to the sunny winter days, which should be rainy winter days. Hopefully we will be getting rain for Christmas, with delivery scheduled for the beginning of January. Camellia sasanqua Kanjiro is still blooming...this is the best year it has ever had. I have been keeping my coffee grounds out of the compost and putting them directly on several of the acid lovers in the yard. They have all responded with vigorous growth and increased bloom. For those dealing with alkaline soil I highly recommend this trick. There are also a few pelargoniums blooming, wax begonias, solanum jasminoides, a few salvias, pansies, and good old dwarf carnation Evermore. 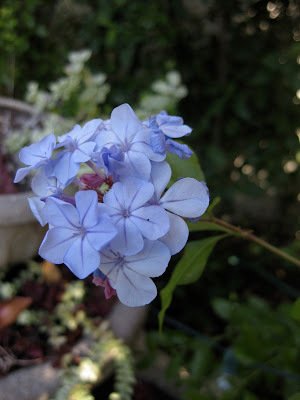 As I write this there are clouds moving in...will Garden Blogger Bloom Day bring us rain? I sure hope so! To see other blooms from near and far please visit Carol at May Dreams Gardens and check out what is happening around the world as the year winds to an end. Just because the year is ending doesn't mean the blooms have stopped! Just in time for the holidays, The Fairy House has opened for guests. Construction has been slow at times due to the lack of complete-or any-building plans. Instead the Fairy House has progressed as inspiration or desperation provided ideas. The opening has taken place because the handles on the front door are at last in place, but finish work will continue for some time to come, if not forever. The first concrete was poured last July. These blocks, made in sideways milk cartons doubled to make them longer, were thought to be the beginnings of walls. River rock was added to the wet concrete for decoration and one special rose rock, a gift from friend Dee of Red Dirt Ramblings, was added over what was intended to be the door. A tower was built, using an oatmeal carton and funnel. At that time the idea was still to build a Fairy Castle. At the beginning of August castle building slowed. A break was needed to work with my husband, downsizing his mother's possessions after she moved into assisted living. In one of many boxes I found small metal decorative pieces. They looked like castle windows to me so construction plans shifted gears. Much larger walls were designed using a form made from two nursery plant trays. 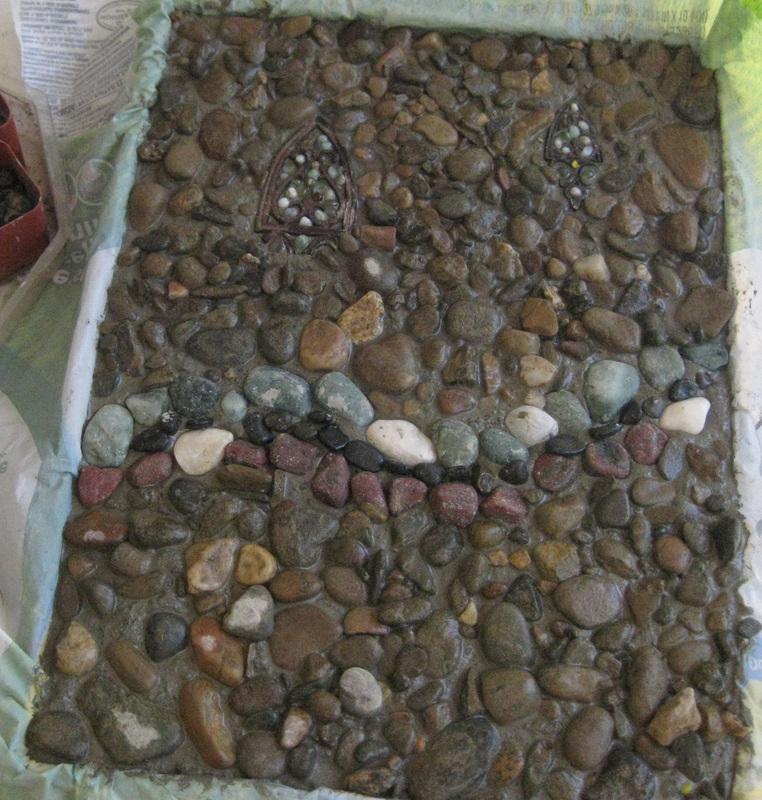 The metal pieces were embedded in the wet concrete and tiny glass stones were added to mimic stained glass. Four walls were made, one at a time, with decorative rock added just because it was so much fun. When the walls were all sufficiently hardened they were put in place, sunk into the ground a few inches, and mortared together. Concrete chunks provided interior stability and the original walls provided exterior support. A second tower piece was made to compensate for the taller walls. Once you start making concrete things it is hard not to see the possibilities for forms and structures! Luckily, concrete is inexpensive. The walls were up! Now inspiration for a roof must appear. And, luckily, before long it did. Fall has arrived...the trident maple leaves decided to fall this week. Cooler temperatures, some rain, the first fire in the fireplace. Yes...it is that time of year. Not my favorite because it somehow makes me sad for no known reason. Maybe it was all those years growing up in snow country and thinking I am soon to be stuck indoors. However, that is not so true here in Central California. Instead of snow on the ground I have beet and carrot seedlings sprouting. and the freesias are coming up through the falling leaves. Lettuce, planted in a pot and covered with wire to keep the rascally sparrows from eating it before we can, is also sprouting. Garlic chive seed heads and fading zinnias mix with sprouting bulbs, promising spring will be here before I know it. Even so, the succulents are tucked in various protected places. Because spring isn't all THAT close. It will just be a little while. It's time for Garden Blogger Bloom Day, November 2011! Thanks to Carol at May Dreams Gardens for inviting us to share what is blooming in our garden each month on the 15th. A few of the pass-a-long chrysanthemums show no damage but many of them have been half eaten by the nasty earwigs. This hollyhock has been blooming for months and shows no sign of stopping; I have no memory of buying it but am grateful that I must have done so. Twinny Yellow Shades snapdragon, grown from seeds purchased after a trip to Filoli where they were growing lush and lovely, struggled all summer but is now coming into its prime. Dwarf Carnation Evermore is a major favorite of mine, blooming for much of the year over the past 5 or 6 years. Salvia Dancing Dolls is another trouper, blooming for months on end. Thanks to Frances at Fairegarden for mentioning in a conversation the other day that her little camellias were blooming. I checked my Camellia Sasanqua Kanjiro and it was indeed also blooming! I hadn't even noticed. Another reason I'm grateful for Bloom Day...it makes me pay attention to blooms that otherwise might be missed. Solanum jasminoides has climbed up into the privet and viburnum and brightens them both. Rosa Flower Girl is prettiest in the fall and spring when the weather is cool enough to allow the pink color to shine. Summer blooms are typically white. Salvia May Night still blooms a bit. It will soon die back for the coldest months, to bloom anew next summer. Many of the November blooms are brighter and more vibrant than the summer versions. Lavender pinnata buchii for instance has a much more intense color. Looking back over these photos I see that all but two (the chrysanthemums and the camellia) are summer-long-and-then-some bloomers here. I like having them to fill in when there is nothing new going on. Other long blooming stalwarts include allysum, anisodontea, wax begonias, bat-faced cuphea, and agyranthemum. Even many of these will soon take a break as cold weather, hopefully including lots of rain, becomes the reality. 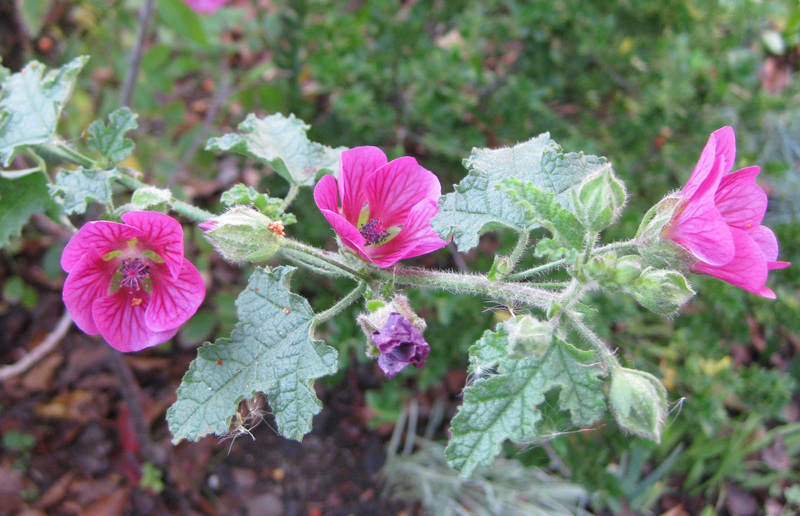 Hollyhock nigra apparently reseed at some point and is just now, for the first time this summer, blooming. Nasturtiums were also slow to get going. Abutilon Pink Parasol, on the other hand, blooms many months of the year. This container of white wax begonias will soon die back to the soil, to return in the spring. These plants are in their 4th summer. Other bloomers include two other abutilons, allysum, Solanum jasminoides, bat faced cuphea, a pink and yellow hollyhock, cosmos, Italian sunflowers, several salvias, lavenders, strawberries, green beans, violas, dianthus, wishful-thinking tomatoes, Rosa Flower Girl, Rosa Demitasse, plumbago, and tulbaghia. Having been out of town on the 15th, which is the official Garden Blogger Bloom Day, I played catch-up in the garden today. Although I took photos a day early I find myself posting a day late. But that means if you head over to May Dreams Gardens you will see what Carol has blooming. And you can check out Mr. Linky to see what is blooming all over the blooming world!